Please click HERE and you will be taken to Facebook for more fun shots. All dogs 6 months or older must be altered to attend daycare or boarding!!!!! 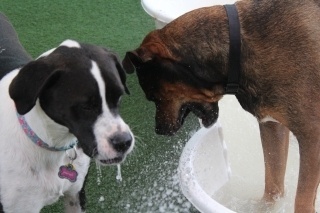 Dog Days’ daycare is a full day of supervised play in our Daycare facility. 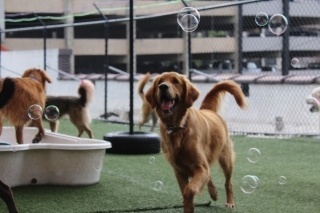 At Dog Days of Birmingham your dog will not be sitting in a concrete run with chain length fence surrounding them all day and a couple of times a day they get a few minutes of play time. We play with your dogs and they play and socialize with other dogs their size and temperament. Come see us and we will give you a personal tour. I know you will see the difference. 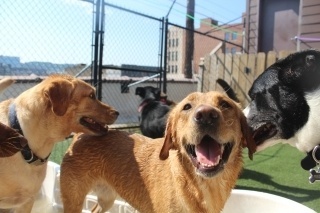 Our daycare programs differ from others by the way we manage your dog’s day. Your dog will be in a group of dogs that they are familiar with because they form a pack or social group. This group can and will change to some degree each time your dog visits because we have new dogs visit each week. Our trained staff monitors the group for any rough play or dominating issues and eliminates any problems before they happen. Our daycare days consist of an early trip to the roof to get some bathroom time and to stretch their legs. They then come downstairs to their playrooms and spend the next couple of hours with their regular pack to play and socialize. This becomes the normal rotation through the day and we offer the groups rest time from 11AM till 12PM with lights out and soft music playing. This gives them a break and lur handlers a lunch break. Our clients have expressed that this schedule has provided a tired and happy dog and that is exactly what they want. We learn from you the owner and the dog what group of dogs would best suite your pooch. Some smaller dogs have grown up with larger dogs and would prefer to play with a larger dog group. If this is the case we will place them where they are happiest. Remember, the dogs are supervised throughout the day and normally certain days of the week have the same dogs in our play groups so your dogs will typically play with the dogs they know. When a new dog is temperament tested and ready to play we will slowly integrate them into a group that best fits their needs. We also provide full disclosure so if you have a pet here you are welcome to visit anytime during business hours. We do not allow any dog to pick on another dog for any reason. If it is not play it is stopped immediately. Normal Business Hours are M – F 7:00 a.m. until 6:00 p.m. There is a $10 fee for picking up late. Extended hours with 24 hour notice are 6AM till 7PM. Our great customers can now earn a reward for attending Daycare. Upon purchasing your 4th daycare package you will now receive free Daycare days. When you purchase your 4th 20 full day daycare package you get 7 days free! When you purchase your 4th 10 full day daycare package you get 5 days free! When you purchase your 4th 5 full day daycare package you get 2 days free! You can now purchase you Daycare and Boarding Packages on our website, below. Click on the PayPal button under the package your wish to purchase. Drop off rate for a single day is $35. Daycare days do not have to be used consecutively. Drop off rate for a single 1/2 day is $18 Daycare days do not have to be used consecutively. A temperament test for daycare is required. Call to schedule today. LATE FEES: Owners of dogs in Daycare not picked up by 6:00 PM will be charged a late fee of $10 unless late pickup is schedule 24 hours in advance. Dogs picked up late will be boarded overnight at owner’s expense. Drop-Ins: Once reserved spots are filled, we will accept drop-ins as space allows. When we have reached maximum capacity, dogs may be turned away. (Maximum capacity may vary according to staff schedule and number of expected dogs.) Please give us a minimum of 24 hours notice if your dog will not be attending daycare on a scheduled day. If no notice is given, you will be charged for 1/2 day daycare.